Bethlehem Steel FC takes on Syracuse University on the training grounds at Talen Energy Stadium in Chester, today at noon. d.F. takes another look at how the roster might fill out for the new USL side. The game is free and open to the public. Those with reservations can then take in the Union game on TV from the comfort of the Club Level at the stadium. The Union Shop will be open for gear sales, but I didn’t see any Steel FC gear which we haven’t already seen. With the first official exhibition game and second-ever competitive match in the very brief history of Bethlehem Steel FC upon us, it should be extremely interesting to see just exactly who the new United Soccer League club send out to face visiting Syracuse University today (Sunday, March 6th) especially now that the Philadelphia Union have finalized their Major League Soccer roster in advance of their MLS season opener versus FC Dallas, a contest will will also be played on Sunday, of course. 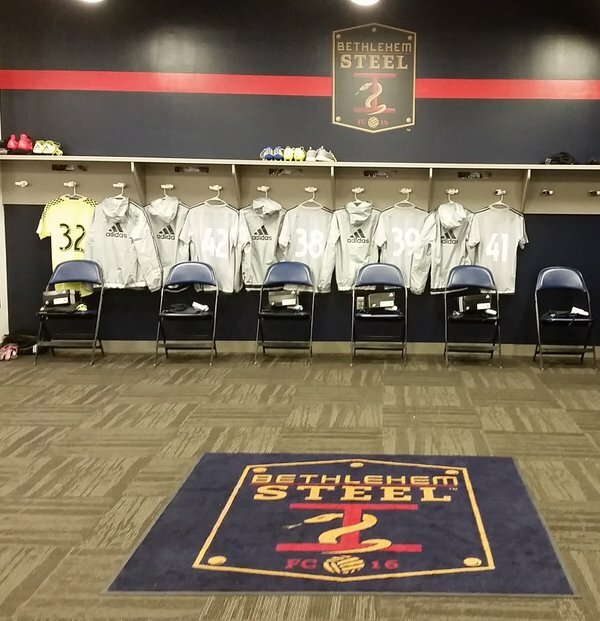 To review, Bethlehem Steel FC only used a somewhat modest total of fifteen players (including two goalkeepers) during their 5-1 training game triumph over National Premier Soccer League (read, fourth division) side Junior Lone Star last week. Also of note is the fact that no fewer than three of the baker’s dozen field players deployed by BSFC were high school-aged players from Philadelphia Union Academy (read: the MLS club’s youth team program). And that recent signing Cory Burke, the striker on loan from Rivoli United FC who earned his first-ever call-up to the Jamaica national team this past fall, did not appear for his new American club either in the starting line-up or as a substitute off the bench. Included in BSFC’s Startelf versus Junior Lone Star were three players who had returned from pre-season training in Florida with the Philadelphia Union first team squad : midfielder Derrick Jones, centerback Mickey Daly and right back Ryan Richter. Apparently still down south, however, was BSFC signing Bolu Akinyode, the 21-year-old Nigerian midfielder from Seton Hall University who put in a half an hour’s worth of work for the Philadelphia Union against MLS club Chicago Fire in an exhibition contest earlier this winter. Regular reader “Old Soccer Coach” checked in to report that Akinyode, who registered a goal and an assist in 21 United Soccer League games (10 starts) last season as a rookie professional for New York Red Bulls II, appeared in the starting line-up for the Union during an informal, 60-minute training game against MLS side Montreal Impact in Florida last Saturday (February 27th), one day after Bethlehem Steel FC took on Junior Lone Star up in southeastern Pennsylvania. Notes – altogether, Toronto FC had four different goalkeepers under MLS contract last season; every United Soccer League team contested a 28-game schedule in 2015. Just exactly which of the two backup Philadelphia Union goalkeepers, the newly-arrived Matt Jones or second-year man John McCarthy, will be Blake’s deputy versus FC Dallas on Sunday remains to be seen. Conventional wisdom certainly suggests that the Union did not arrange for the loan of Jones just so the 29-year-old shot-stopper with six and a half years of experience in the Portuguese first and second divisions could get some games in the third tier of American professional soccer. And that would mean that the 22-year-old McCarthy, the La Salle University product who was named not only the USL Rookie of the Year but also the USL Goalkeeper of the Year as a noteworthy member of the Rochester Rhinos in 2014 could be on the Steel side. Philadelphia Union rookie Cole Missimo is one player who might very well be sent out on loan to get some games for fledgling Bethlehem Steel FC during the 2016 USL, too. The 23-year-old winger out of Northwestern University, a two-time 2nd Team All-Big Ten selection, was the fourth round choice (# 64 overall) of the Philadelphia Union at the 2016 MLS SuperDraft and displayed some of his wares early on in training camp. But, after appearing in Philadelphia’s first two exhibition games in Florida this winter and netting his first career goal for the Union in the 4-2 loss to the Chicago Fire, as well, Massimo did not see the field at all in any of his team’s final four pre-season matches. Aging French import Sebastian Le Toux, off-season American acquisition Chris Pontius, the newly signed Brazil international Ilsinho, former NASL all-star Walter Restrepo and the teenaged Cameroonian Erik Ayuk all figure to be ahead of Massimo for playing time on the Philadelphia Union’s flanks at the moment. As previously mentioned Bethlehem Steel FC actually used a trio of Philadelphia Union Academy players – left back Matthew Real, centerback Auston Trusty and midfielder Lamine Conte – in its training game against NPSL side Junior Lone Star. One is inclined to believe that these three players now have a leg up on being among the Academy players on the roster of BSFC this season (assuming a league which seems to realize its role as a development circuit has not changed its rules since last term). Indeed, it should be interesting to see if Real, Trusty and/or Conte continue to log minutes as BSFC plays out its exhibition schedule this March. Bibbs, the 25-year-old right back from Syracuse University who was limited to 13 USL appearances for Saint Louis FC partly because of injury last season, has been struggling with fitness as of late, too, and is questionable for Bethlehem Steel FC’s exhibition contest against his former school.